In its regular guise, the Mercedes-Benz E-Class is the go-to vehicle for customers looking for a mid-level luxury sedan that can carry them from point A to B without a fuss. In India, where it sold exclusively in the long-wheelbase form, it targets buyers who would much rather sit back and relax leaving driving duties to their chauffeur. What if you’re one of those who want a bit more, though? Someone who wants more performance, more drama, more madness even? 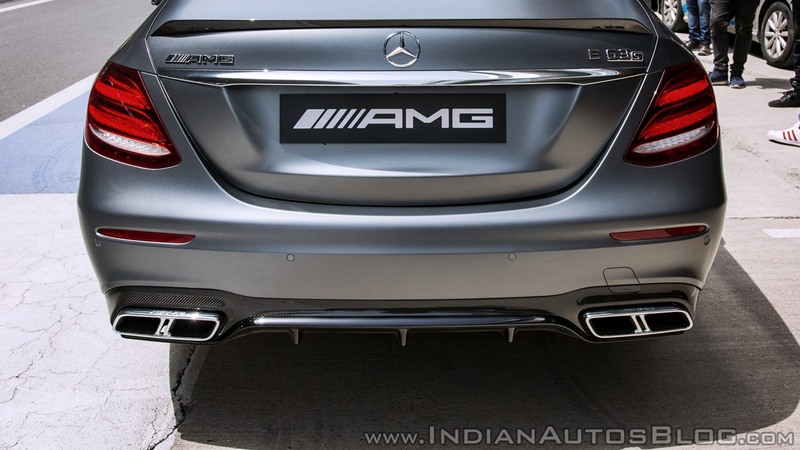 Presenting the E 63 S 4MATIC+ courtesy Mercedes’ Affalterbach-based outfit, AMG. 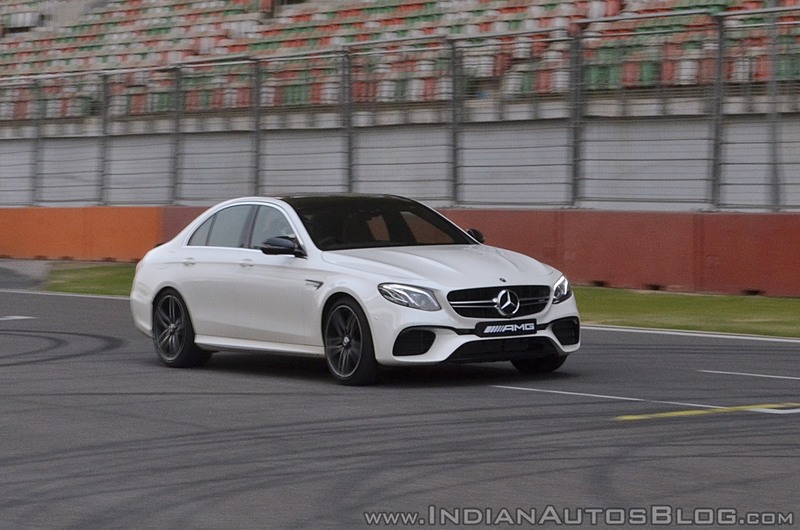 The Mercedes-AMG E 63 S 4MATIC+ has gone on sale in India for an asking price of INR 1.5 Crore and I had a go in one at the Buddh International Circuit. Aside from being based on the regular wheelbase E-Class, the AMG’d E gets a handful of visual differentiators. Up front, there’s a new bumper with larger air intakes and a twin-louver grille with a big bold three-pointed star sitting in the middle. The bonnet has more creases as well as a different shut line. 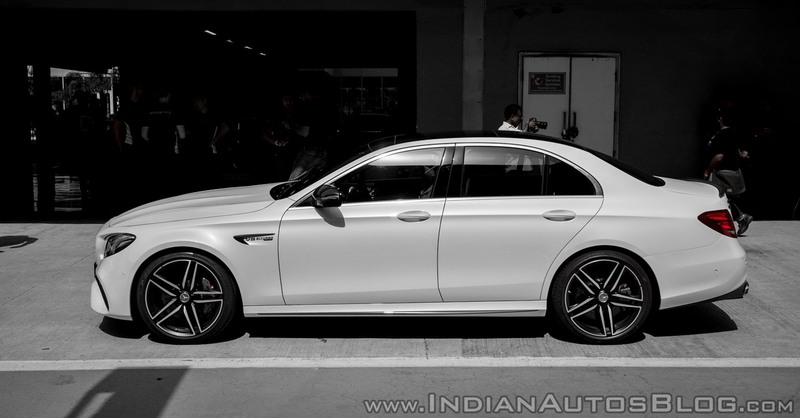 Over to the side, the E 63 S gets massive 20-inch rims and ‘V8 BITURBO 4MATIC+ ’ badging. The tail features a new bumper with a diffuser and a quad exhaust setup. The changes, overall, are rather subtle with the biggest giveaway of its AMG credentials being the relatively shorter wheelbase. The Selenite Grey Mango with the black cross-spoke wheels looked menacing enough and I, for one, wouldn’t have it any other way as part of the charm of a super saloon is its discreet appearance. Mercedes-Benz will let customers of the E 63 S choose from 8 exterior colour options - Obsidian Black, Cavansite Blue, Kallaite Green, Diamond Silver, Iridium Silver, Selenite Grey Mango, Diamond White Bright, and Hyacinth Red Metallic. Additional customization options include 4 rims designs and 3 upholstery, 9 trim, and 5 centre console finish options. The dashboard layout is quite similar to the regular E-Class. The major and most noticeable change is that the instrument console in the E 63 S is fully digital sitting flush with the central infotainment display. Customers can choose from multiple upholstery and centre console finishes. It can be specced with racy AMG Performance Seats as well. 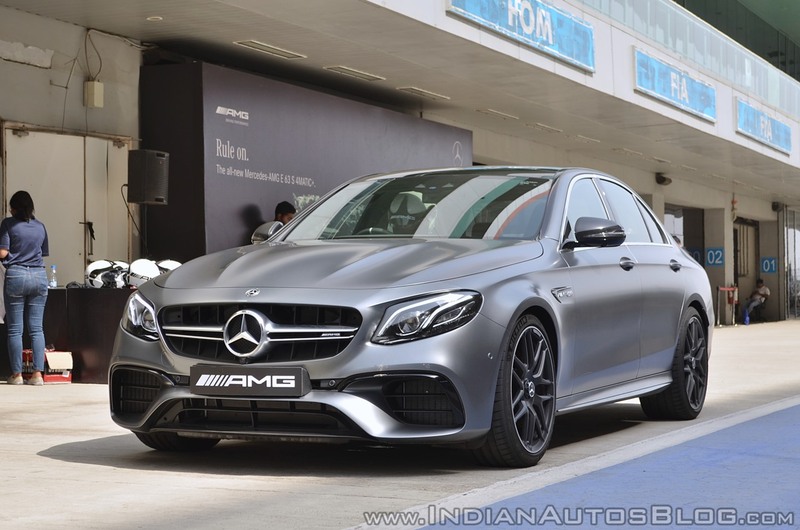 The E 63 S comes with all the bells and whistles one would expect in a luxury sedan including a three-zone climate control, air conditioned front seats, wireless charging, an audio system from Burmester to name a few. Quite obviously, being based on the regular wheelbase E, the rear seat space isn’t as generous as the E LWB’s, but that’s irrelevant in this case, to be honest. I didn’t waste my time in the back seat and neither should you if you’re going to buy one. Under the hood is the E 63 S’ pièce de résistance – A 4.0 L twin-turbo V8. Before we move forward, allow me to throw some numbers at you. There’s max power of 612 hp generated at 5750 – 6500 rpm and peak torque of 850 Nm that comes in between 2500 and 4500 rpm. The 9-speed transmission sending power to all four wheels via Merc’s 4MATIC+ all-wheel-drive setup helps the car sprint from 0 to 100 km/h in just 3.4 seconds. Top-speed is limited to 250 km/h but can be increased to 300 km/h with the AMG Driver’s Package. Lest I forget, the growl from the twin turbo V8 is absolutely divine. 4MATIC+ helps modulate torque between the front and rear axles ensuring optimum traction as per the requirements. For the skilled and the brave, there is a pure two-wheel drive drift mode that can be engaged only when the ‘Race’ drive programme is selected. 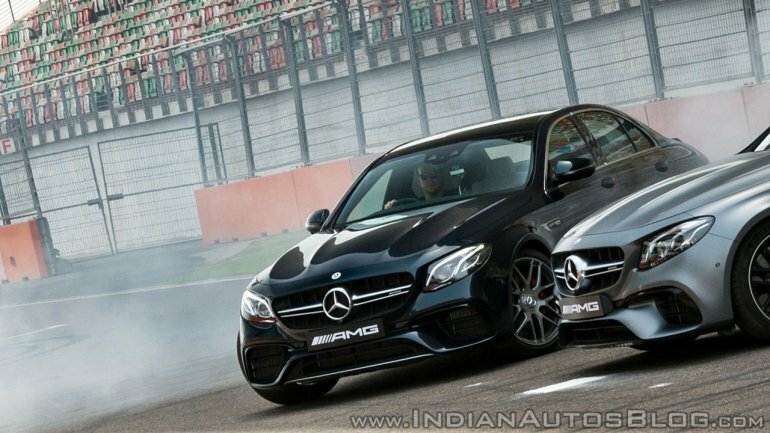 Compared to the previous generation model, a big change in the suspension department comes in the form of the use of AMG tuned Air Body Control. Braking duties are handled by steel discs on all ends or the optional Carbon Ceramic discs. 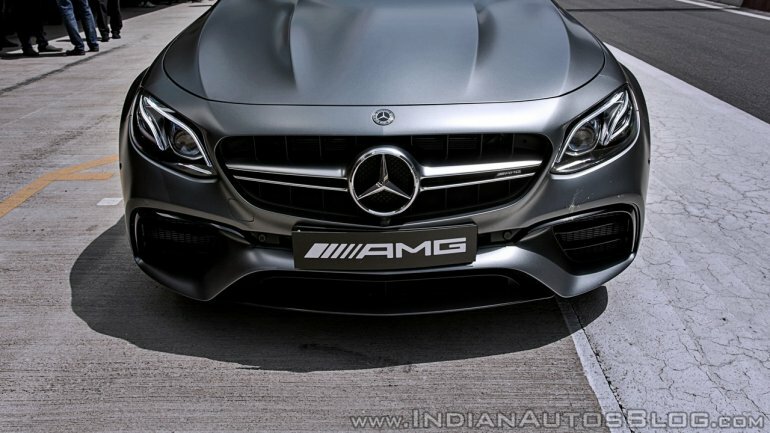 The presence of which can be identified by bronze painted brake callipers with "AMG Carbon Ceramic" lettering. I didn’t get too much time behind the wheel of the Mercedes-AMG E 63 S so, I will be unable to touch upon each aspect pertaining to the driving characteristics of the car in great detail. As you may have guessed from the numbers mentioned above, this thing is incredibly quick. The BIC’s 1.06 km long back straight is more than ample road length for the E 63 S to hit its 250 km/h top speed. The presence of onboard electronics meant that I was able to push to the car without worrying too much about binning it. Carbon ceramic brakes and the savage acceleration help dispatch corners quickly and the well-weighted steering wheel helped me place the wheels with precision. The 2-tonne kerb weight of the E 63 S is apparent through corners, but the air suspension and onboard electronics ensured it managed to stay composed through the twists and turns thrown at it. In this segment, the only other choice you have is the BMW M5. There’s the Audi RS6 as well, but its a generation old now and the new one should be out this year so, let’s discount that for now. Both the Merc and the Beemer make 600 hp +. The E 63 S has a higher torque output by 50 Nm, but I seriously doubt most will ever notice the difference. So, it boils down to personal preferences, then. The Mercedes-AMG E 63 S does the whole 'Jeykell and Hyde' thing rather well. It can be a daily driver when you need it to be. And it will be equally good, if not better, as a track day beast. There are four doors, four seats, a big boot, climate control, high-end audio setup and all that jazz making it practical and there’s ‘drift mode’ for when you want to slide about and chew through some tires. If you have the money, then please don’t hesitate to get yourself one.